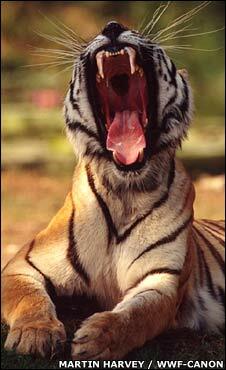 Governments need to crack down on illegal tiger trading if the big cats are to be saved, the UN has warned. The Convention on International Trade in Endangered Species (CITES) meeting in Doha, Qatar heard that tiger numbers are continuing to fall. Organised crime rings are playing an increasing part in illegal trading of tiger parts, CITES says, as they are with bears, rhinos and elephants. Interpol is working with CITES to track and curb the international trade. Last year, World Bank chief Robert Zoellick said the global black market in wildlife products was worth about $10bn per year, making wildlife the third most valuable illicit commodity after drugs and weapons. Despite attempts to protect tigers, numbers have approximately halved over the last decade, with fewer than 3,200 remaining in the wild. The decline is seen across sub-species and in most range states. Many populations are small, and are threatened by deforestation as well as poaching. "If we use tiger numbers as a performance indicator, then we must admit that we have failed miserably and that we are continuing to fail," said CITES secretary-general Willem Wijnstekers. "Although the tiger has been prized throughout history, and is a symbol of incredible importance in many cultures and religions, it is now literally on the verge of extinction." CITES enforcement officials said government agencies including police and customs needed to step up efforts to combat the illegal trade. Although China and other East Asian countries are the principal consumers of tiger parts, exports travel much further afield. Earlier this month, Operation Tram, co-ordinated by Interpol and including enforcement authorities in 18 countries, netted medicines containing wildlife products worth an estimated $10m. Tigers, bears and rhinos were among the animals used in making the medicines. Conservationists also point to China's tiger farms as a threat to the wild animals. Although China does not officially permit the sale of goods from these farms, in practice several investigations have revealed tiger parts are being sold. Campaigners warn this perpetuates a market into which wild tiger parts can be sold, often commanding a higher value as products made from wild animals are perceived to be more "potent." Just before the CITES meeting opened, the World Federation of Chinese Medicine Societies (WFCMS) called on traditional medicine practitioners to abandon the use of tiger parts. "We will ask our members not to use endangered wildlife in traditional Chinese medicine, and reduce the misunderstanding and bias of the international community," said WFCMS deputy secretary Huang Jianyin. "The traditional Chinese medicine industry should look for substitutes and research on economical and effective substitutes for tiger products." A resolution before the fortnight-long CITES meeting calls for greater co-operation between regional enforcement authorities to cut down the tiger product trade, and to ensure that breeding operations are "consistent with the conservation of wild populations".